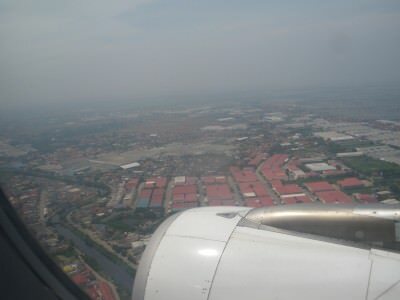 Flying into Jakarta, Indonesia. How to get a visa on arrival? 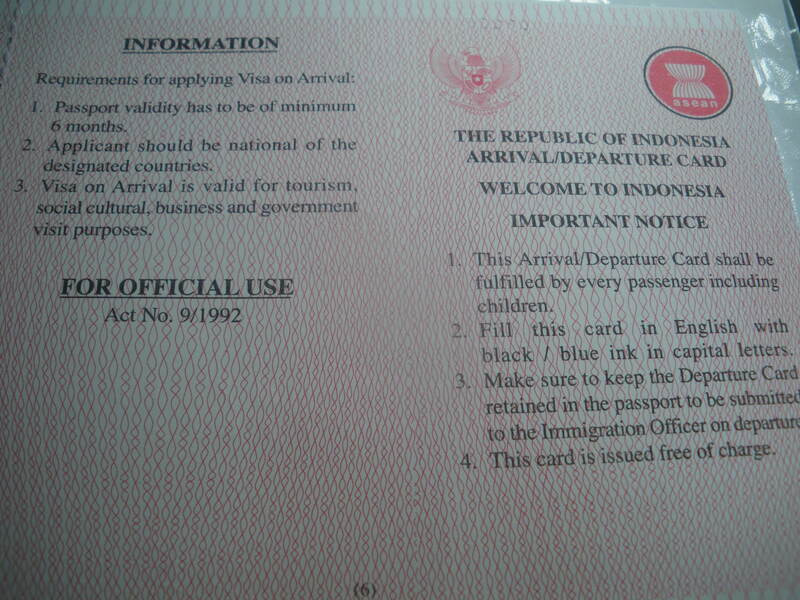 I recently wrote about how to get an Indonesian Visa on arrival in Denpasar Airport in Bali, so I’d thought I’d also share my information on getting the visa on arrival in Jakarta – pretty similar of course, but worth posting for those coming into the country at Jakarta Airport. 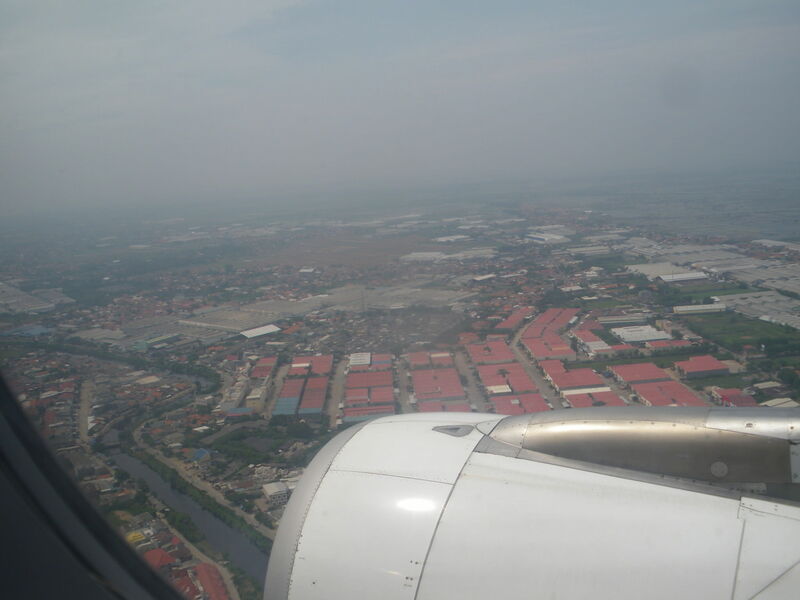 I first visited Indonesia in 2012, flying in to Jakarta. 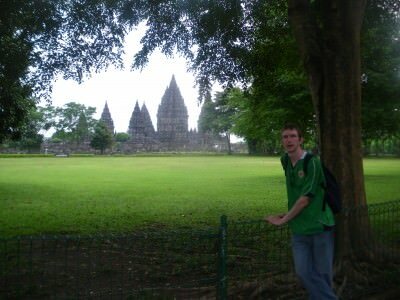 On that occasion myself and my Brazilian mate Rodrigo toured a load of the sites of Java and Bali and loved it. 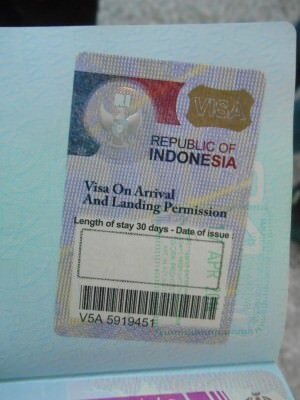 On arrival at the airport in Jakarta, you will notice a sign for “Visa on Arrival” and “Non Visa on Arrival” as well as the Transit and Transfer section so I headed straight to the visa on arrival section. 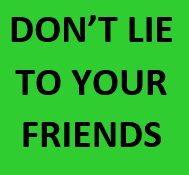 It’s very simple – name address, passport number, place of stay etc. 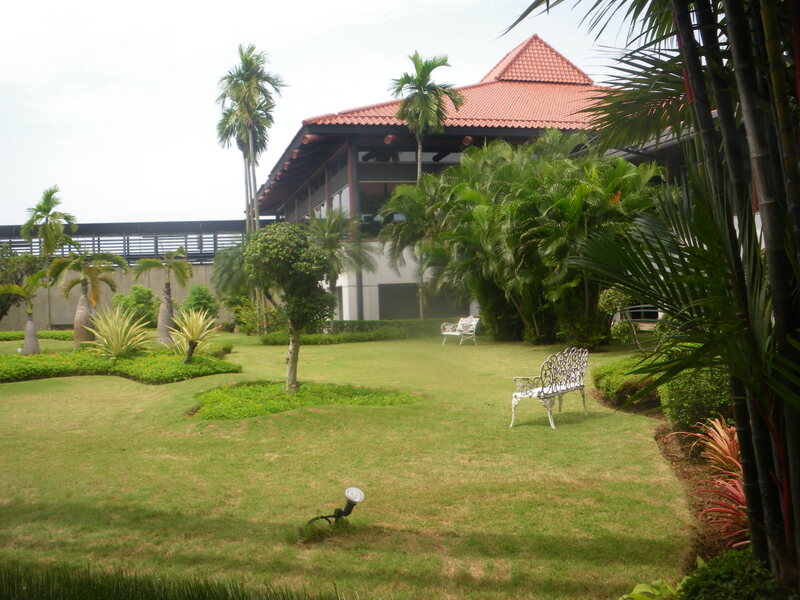 Length of stay is also important – you get a maximum of 30 which you need to renew if you want to stay longer (or cross into Malaysia/East Timor overland if need be). 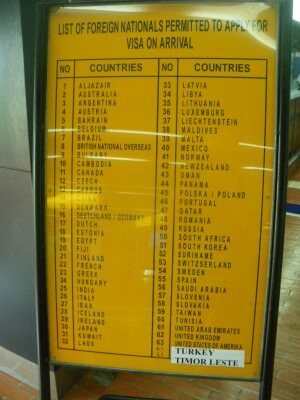 Countries that require an Indonesian Visa on arrival in Java. 4. Join the queue for immigration (it can be long on busy days – so if you haven’t filled in your immigration forms yet – just do it in the queue, always carry a pen). 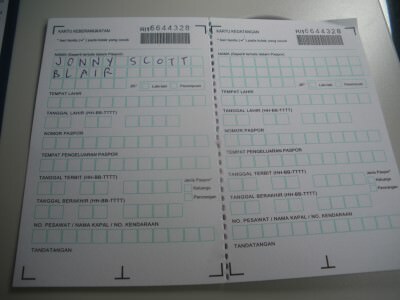 The form is very easy to fill in as I mentioned and similar to the Malaysia one (though Malaysia doesn’t require a visa or payment – you just get a stamp on an Irish/British passport). 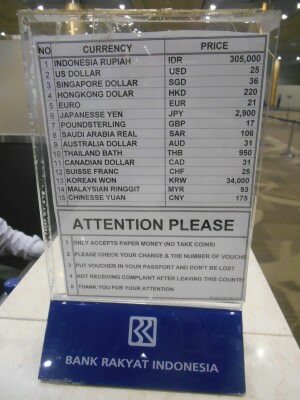 Once you get to the immigration counter, the official will check the details, take your payment receipt and stamp your visa onto your passport. 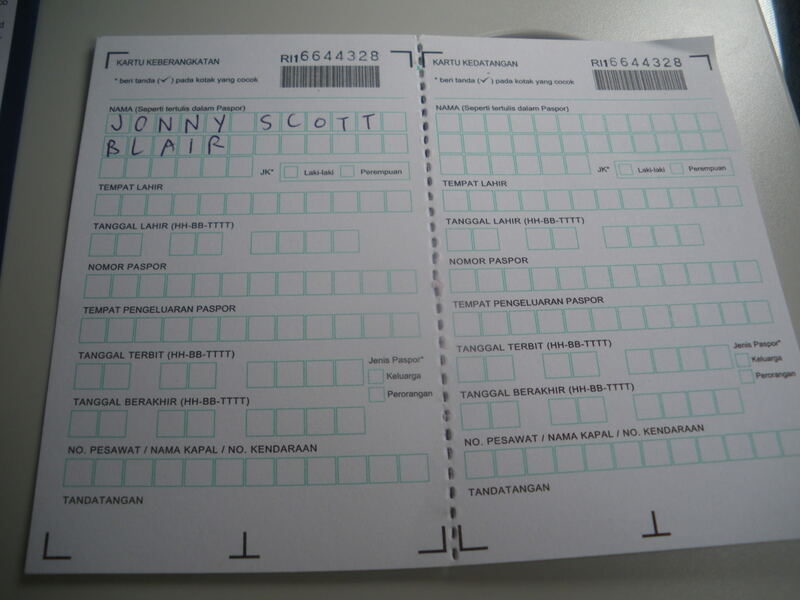 You will be given your departure card back to keep and also one of the 2 payment slips you got. You will need to keep these for leaving the country. I’ve been to Indonesia 3 times, in 2014 the visa is purple, in 2012 it was brown. You should also pick up the customs form and fill it in ready to hand in to the next desk after getting your visa. They just take it off you, check your bags (put them through the scanner) and that’s it. 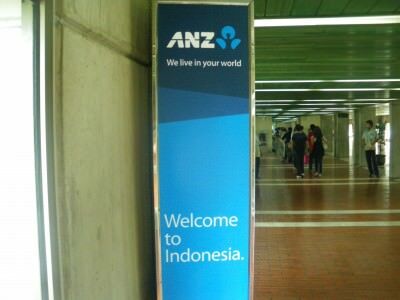 You’re now in Indonesia! What Next Once I’m Through Immigration? This entry was posted in Asia, Destinations, Indonesia, Jakarta, Java, Visas. Bookmark the permalink. Do you think I need a full empty page in my passport for the visa? My passport has no totally empty pages so I’m wondering if I need to get a new one! Any photos reqd, any particular background for pics? Any proof of financial support during stay reqd? Any pics reqd for VOA? Any back ground colour? 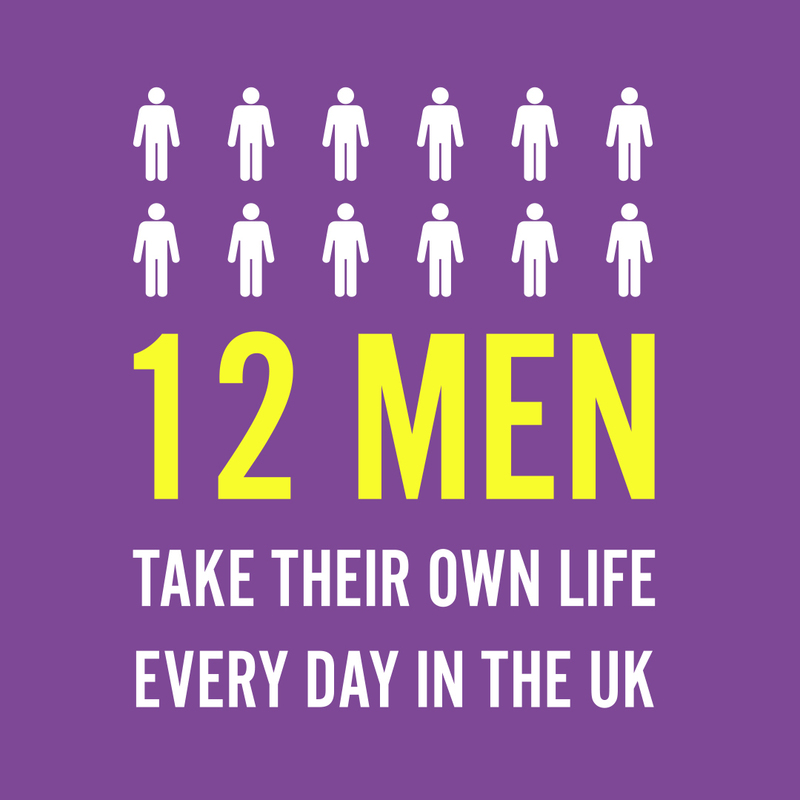 Any proof of financial support during stay? 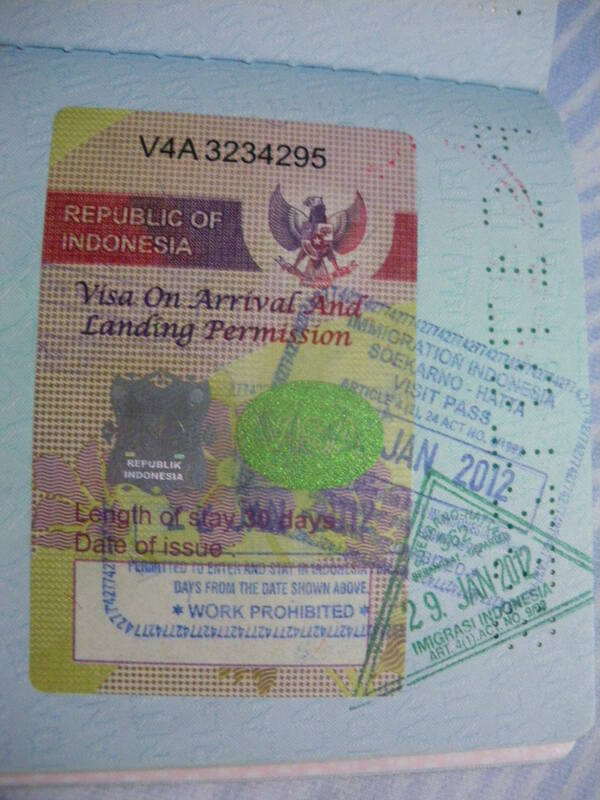 i want to ask u how can i got visa of singapore in jakarta airport??? and wt is the expense of it?? 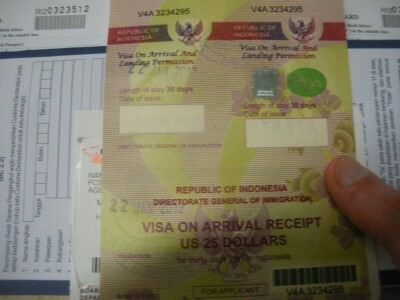 Thanks for posting about the visa on arrival! Im blind about these information. So thank you! Thank you soo much for your post. It is very helpful. However I have a question about connecting flights. I will be flying to Jakarta then transfer to domestic flight 2 hours later to Surabaya, which is also an international airport. 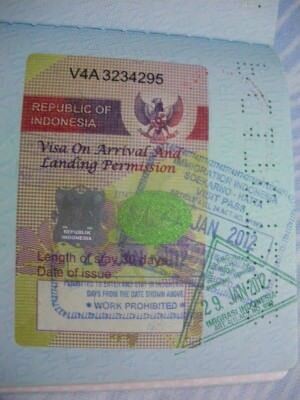 Do I need to go though passport and customs in Jakarta first, then be off to Surabaya? Or can I do all the paper work in Surabaya? It’s the same ANA airline for both international and domestic. Thank you soo much for your time. 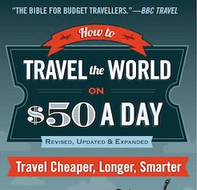 Need guide for your travels? Late 2016 VoA fees: Jakarta IDR 500,000, Batam IDR 505,000 or foreign currency equivalent. 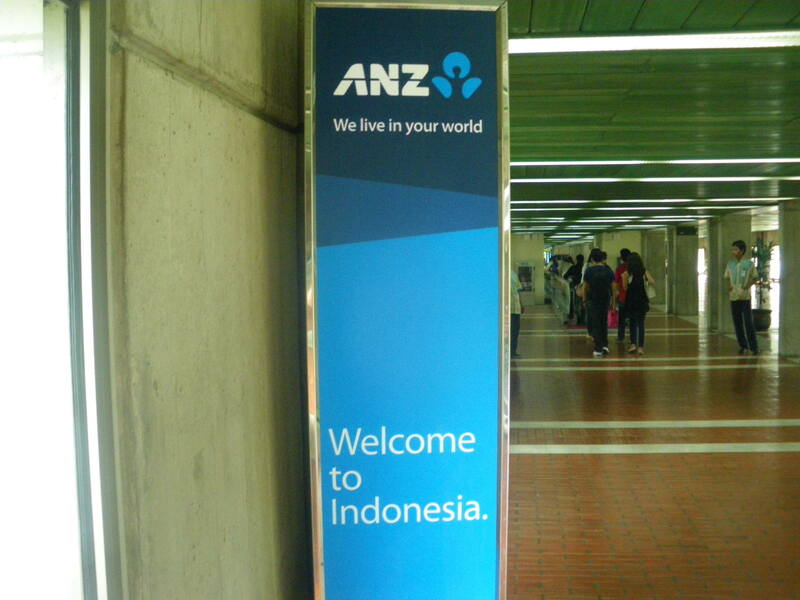 Maybe things have changed since you wrote this; British passport holders do not require a visa for Indonesia unless they are there for business. 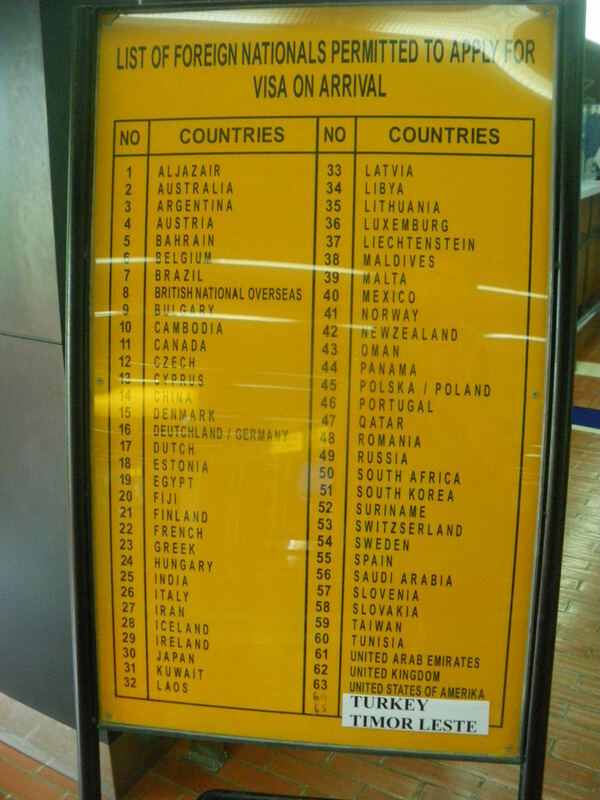 So no visa needed for tourists. Hi, if I took the currency then 300000 is huge amount so how to take from ATM? ?At present have only credit card so can it be possible to do payment through credit card?? Did they ever ask you for your return ticket or tickets of your next journey? I see you didn’t mention it here but you also probably had your ticket. Thanks. Bro im going from india to jakarta on march 2018. Do i need a return ticket?? I dont have visa. 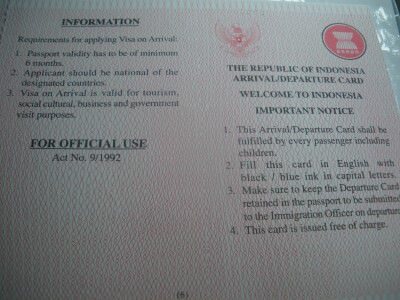 I have passport , n id card. N i also dont have a valid driving licence. Im confuse . Can u help me ?? 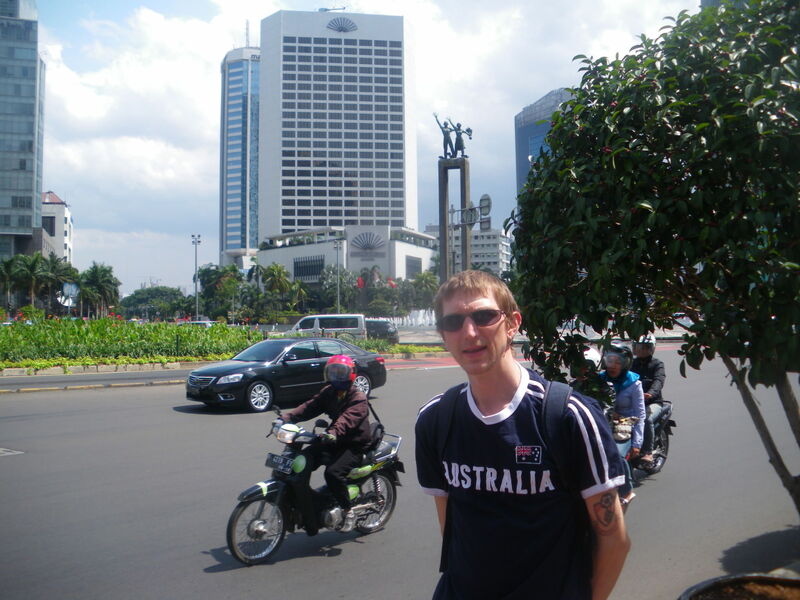 hi jonny,we are planning to go to Indonesia,what documents require for visa on arrival other that the information posted by you is amazing and really helpful..thanks a million. Hi Jonny, I just changed my citizenship to America. But planning going home to Jakarta this year sometime. 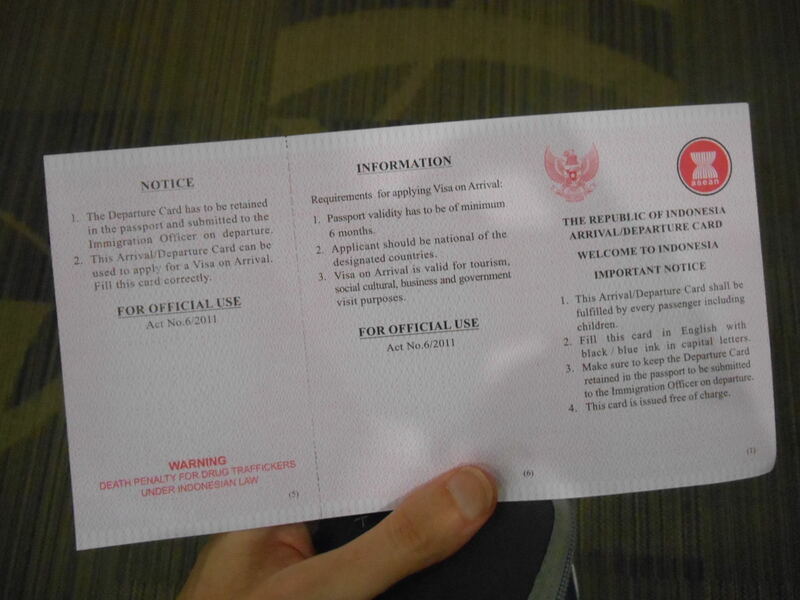 I know about Visa Arrival at the Airports. But your information is very clear and helpful. And i read you sound enjoyed in Indonesia. Glad to know. The Emigration only gives Visa Arrival only for 2 weeks?